The real estate market is red hot! Across the country, home prices are soaring and new homes cannot be built fast enough. Did you know the crooks are also cashing in on this lucrative market? The BEC is nothing new. Crooks have been using this scheme for the past few years to successfully deceive businesses. 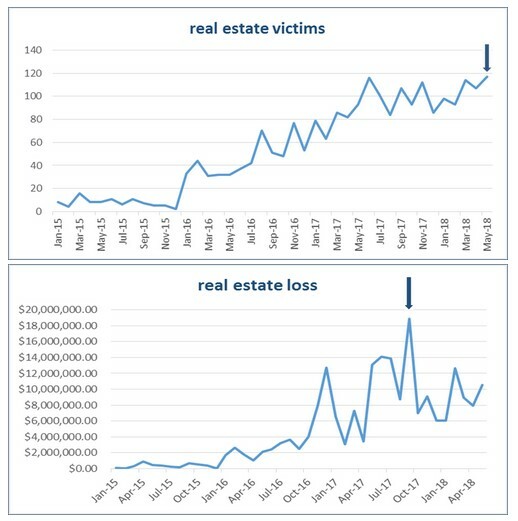 However, according to a recent article from the FBI and Internet Crime Complaint Center, real estate Business Email Compromises are on the rise. So much so, that they have exceeded $12 Billion! From October 2013 to May 2018, domestic and international exposed dollar loss is $12,536,948,299. Notice that this statistic includes international dollars too. Often, the crooks will receive funds from a firm in North America, and funnel the money through an overseas bank account. This is truly an international problem. It is organized crime at its best. Take a look at these charts below highlighting the rise in losses. The easiest way to avoid being a victim is to verify all requests and changes in payment and wiring instructions. Be sure to confirm these either in person, or on the phone using a number that you already have. DO NOT use anything in the email, requesting the change, UNTIL you have confirmed it. Remember to slow down. The Internet is a great way to learn about your new home. Pictures, videos, and statistics are readily available. The crooks will use this information too. They will craft very legitimate looking emails to make you believe them. Slowing down and confirming what you are being asked to do is key to avoid being a victim. Finally, if you discover a fraudulent transfer, remember that acting quickly is crucial – that is not the time to slow down. The very first call you need to make is to your bank that you sent the money through. Even acting quickly, the bank may not be able to get the money back to you. There are a lot of circumstances surrounding this process, so acting quickly is the best first step. Your bank will work quickly with you too. After talking with your bank, you should also file a complaint, regardless of the dollar amount, with the Internet Crime Complaint Center (IC3) at www.ic3.gov. Raise awareness. Please share this article with everyone you know in the real estate business. Awareness is the first step toward prevention.